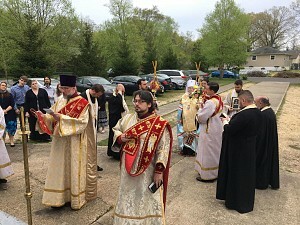 On Saturday the 5th and Sunday the 6th of May, the feast of the Holy Great-Martyr, Trophy-Bearer, and Wonderworker George, Metropolitan Hilarion of Eastern American & New York paid an archpastoral visit to St. George Kuban Cossack Church in Howell, NJ, to lead the divine services for the parish’s patronal feast day. 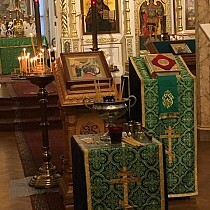 At Vigil, His Eminence was co-served by parish rector Archpriest Serge Lukianov, and clerics of neighboring St. Alexander Nevsky Diocesan Cathedral: Archpriests Boris Slootsky, Seraphim Chemodakov, and Petro Hnatkivskyy, and Protodeacons Leonid Roschko and Paul Drozdowski. 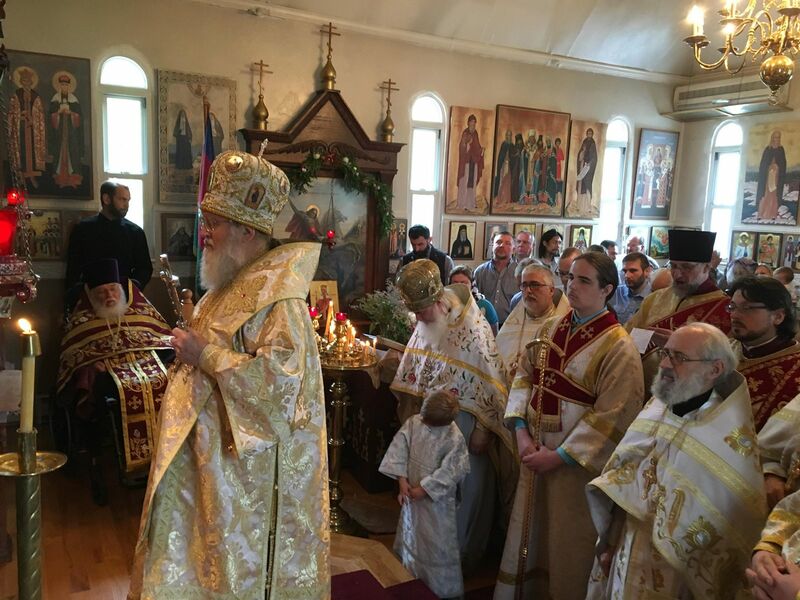 At Liturgy the following morning, they were joined by Archpriests Rafael Melendez (cathedral cleric), Petro Kunitsky (cleric of Holy New Martyrs Church in Brooklyn, NY), and Vasiliy Raskovskiy. Also praying in church was Protopresbyter Valery Lukianov (dean of New Jersey). At the Little Entrance, for his dedicated service to the parishes in which he serves and to the Eastern American Diocese (of which he serves as secretary), Fr. Serge was awarded the right to wear the miter. The moment was especially touching, as the miter which the Metropolitan awarded him had belonged to Fr. Serge’s grandfather, Archpriest Peter Motcharsky (+1977). 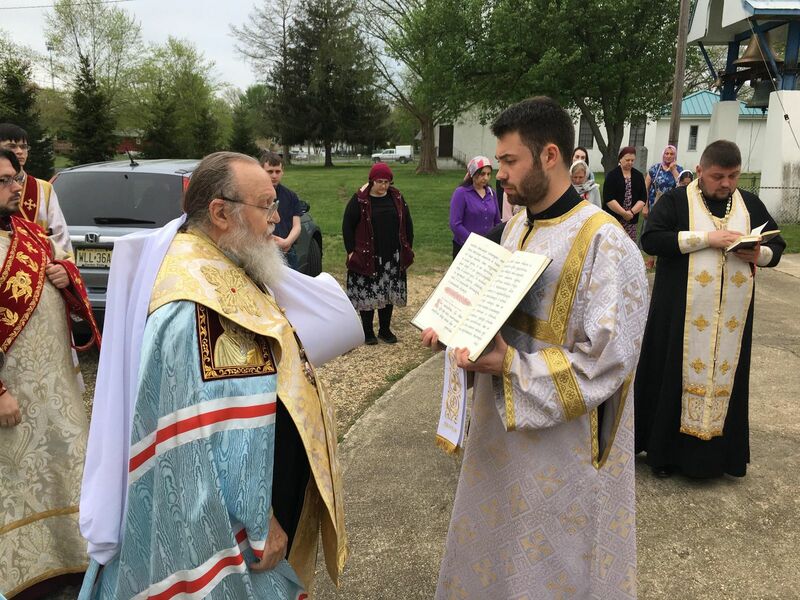 Many of the faithful, including members of the Kuban Cossack Voisko headquartered at St. George Church, received Christ’s Holy Mysteries from two chalices. "Christ is Risen! 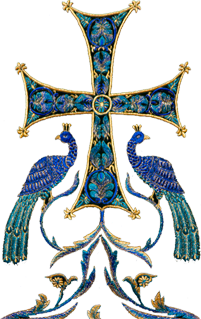 I sincerely greet you all, dear brothers and sisters, with today’s marvelous feast of the Holy Great-Martyr and Wonderworker George, and the Empress-Martyr Alexandra. Martyrdom has always been viewed in the Christian Church as a great spiritual feat: sacrificing yourself for Christ. The very word in Greek, martyras, means ‘witness.’ Truly, the martyrs bore witness to their fidelity to the Lord, to their love for Him, to their selflessness, even unto death. And for this reason, they have always strengthened the faith of other Christians. Looking to the saints, the faithful also gain inspired faith and fidelity to the Lord. This also had a profound effect on the pagans who carried out these martyrdoms: they were astonished, how these people gladly endured suffering and death for their God and for Christian teachings. Many pagans converted to Christianity as a result of such witness, including the Empress Alexandra, wife of the Emperor Diocletian. Seeing the martyrdom of St. George, she believed in Christ, and would soon be martyred herself. Martyrdom belongs not only to antiquity, but extends even until today; we have seen how many New Martyrs gave their lives in Russia, perhaps more than in the whole history of the Church to that point. These now stand in the presence of God and rejoice; they are our Heavenly intercessors, and they call upon us all to stand firm in the Faith, to love God, and to be in the Church, participating in the Holy Sacraments. Only in this way will we ourselves be able to endure any possible persecution." The Metropolitan greeted Fr. Valery, and congratulated Fr. Serge on his award and all of the namesday celebrants. In turn, Fr. Serge greeted the First Hierarch of the Russian Church Abroad, thanking him for his archpastoral visit and prayers, as well as for the great trust demonstrated by the bestowing of this honored award. The Protodeacons intoned the Polychronion for the hierarchs, parishioners, and many namesday celebrants: Georges and Alexandras, as well as Svetlanas and Photinis (in honor of the Sunday of the Samaritan Woman). As the faithful came up to kiss the Cross, they were handed a gift from the Kuban Cossack Voisko: orange-and-black St. George ribbons. A luncheon for all was held in the Cossack hall next door, featuring classic fare of cutlets, potatoes, pickles, and salad, as well as a whole pig, roasted by the Cossack brotherhood. The faithful enjoyed informal interaction with one another; words of Paschal greeting were spoken, and Fr. Valery offered a brief commentary on the importance of youth for the future of the Church and community.